We are pleased to announce the promotions of Darin Horst, AIA and Brandon Sire, PE and to associate principal. Darin Horst, AIA, EDAC, ACHA, is a licensed professional architect with more than 25 years of experience. Horst earned a Bachelor of Science degree in Architecture in 1994, followed by a Master of Science in Architecture in 1996, both from the University of Nebraska-Lincoln. Horst’s design experience spans a variety of project types with a strong focus on healthcare. 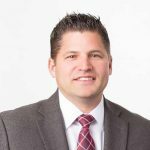 He manages several healthcare clients including Memorial Health Care Systems in Seward and Jefferson Community Health and Life in Fairbury and serves as the lead architect for many Bryan Health projects. Horst is an EDAC (Evidence-Based Design Accreditation and Certification) certified architect, as well as an ACHA (American College of Healthcare Architects) board certified architect, one of four in the state of Nebraska. Brandon Sire, PE, LEED-AP, is a licensed professional mechanical and fire protection engineer. Sire earned a Bachelor of Science in Mechanical Engineering from the University of Nebraska-Lincoln in 2000 and joined Davis Design in 2006. With more than 18 years of engineering experience, Sire serves as the mechanical department manager. His knowledge and leadership in the field covers a vast range of projects in the military, corporate, education and industrial sectors. Notable projects include the Greenhouse Innovation Center at Nebraska Innovation Campus, Oxbow Animal Health in Papillion and currently, the Nebraska Department of Corrections Reception and Treatment Center. Sire is a member of the American Society of Heating, Refrigerating and Air Conditioning Engineers (ASHRAE) and serves on the board for Star City BMX. Davis Design is committed to making ideal happen through innovation, problem solving, and thoughtful solutions. Our design experts offer a full spectrum of architecture, structural, mechanical and electrical engineering, interior design, contract furnishings and construction administration services across the Midwest.